Fall is my favorite season in New York. I’m always the first to put on a cashmere sweater and switch back to hot coffee. Happily, with a new season come new ingredients. I love to cook at home and try to incorporate seasonal ingredients into my dishes whenever possible. Last week at the Union Square Farmers Market, I picked up a bunch of local carrots. Today I transformed them into a quick lunch dish using ingredients I already had in the kitchen. This dish tastes great on its own, but also is a versatile side for just about any protein. Heat butter in a 4-5 Qt saucepan over medium heat. Add shallots, curry powder and salt/pepper. Saute for about five minutes until the shallot softens stirring occasionally. Add chicken stock and 2 cups of water to the pot and bring to a boil. Add carrots and lower temperature to a simmer. Simmer for about 10 minutes and then add rice. Allow to cook for another 10 minutes. 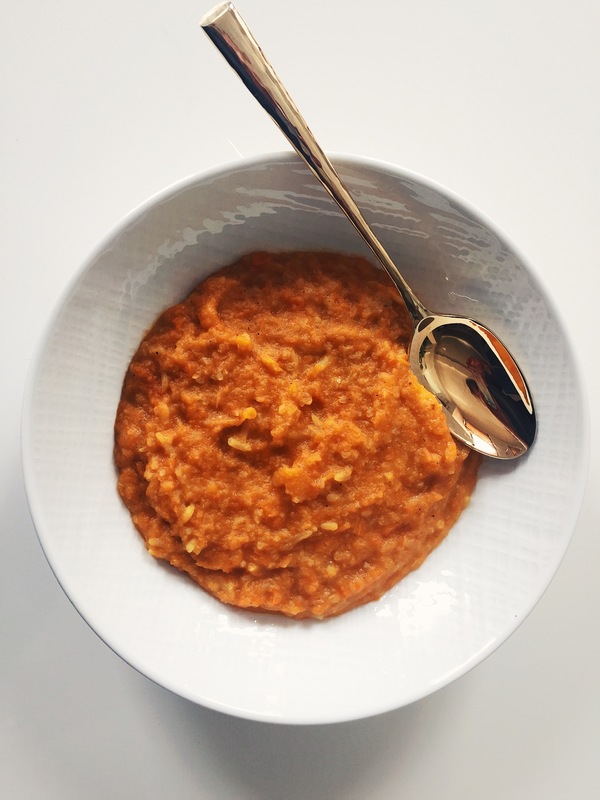 Use an immersion or free-standing blender to mash ingredients to a thick purée/porridge-like consistency. You can also add water to thin into a soup. Squeeze lots of lemon and mix. If you have cilantro handy, top if desired.